In 2018, Thunderhead was named as a Leader in the Forrester Wave™ for Customer Journey Analytics for the second time. The Wave is comprised of two reports: Journey Orchestration and Visioning. And while I’m an unashamedly proud parent, I also know that this is a hot category, worthy of huge focus from marketers and CX leaders. The customer experience community is experiencing long-awaited and significant shifts in attention. This is driven in a large part by the digital economy (and the success of new business model innovations such as direct-to-consumer) and the subscription economy. It’s long-overdue. Back in 2014, Thunderhead was embarking on a journey of our own. At the time it was clear to us that things were changing, brands were struggling to keep up with the pace of technological change and its effects on customer behaviour and expectations. While hyperbole was abundant, the reality was that no solution existed that genuinely put customers at the epicentre of their own experience. Brands spoke to ‘customer-centricity’ and ‘engagement’ at conferences but were hampered by fragmented technology, departmental silos and legacy infrastructure that was aimed squarely at serving the needs of the brand, not those of the customer. Meanwhile, we started work on building a framework for understanding what was actually needed to build truecustomer engagement. Our findings, summarised in our Engagement 3:0 Report, are as relevant now as they were at the time. We knew that a fresh solution was needed. And the concept of an ‘intent-driven journey’ was born. At its heart, this is about understanding customer intent as they traverse your brand, and then using this insight to orchestrate the best experience for every individual customer, across their unique journey. Rather than pushing brand or product to a segment, intent-driven journeys hand significant control over to individuals by recognising their goals and helping them reach these quickly. Hype aside, this is true customer-centricity. Unconstrained by legacy technology, we needed to develop a platform to connect, understand and orchestrateacross all channels (not merely digital). It would need to be quick to deploy, easy for the business to use and power seamlessly at scale, of course. But crucially, journeys had to be based on the needs of the customer (and not simply the brand). To make intent-driven journeys a reality, we needed to set about building our technology from scratch, using the latest that AI and machine learning could provide. This came with challenges; flying in the face of perceived wisdom can be a lonely existence. But we persevered. And thousands of hours and coffees later, the ONE Engagement Hub was launched. Fast-forward to the Forrester Wave™. The Market had woken up to the commercial importance of customer engagement and by association, the role of intent-driven journeys. Crucially, the enabling technology could finally deliver on the promise. 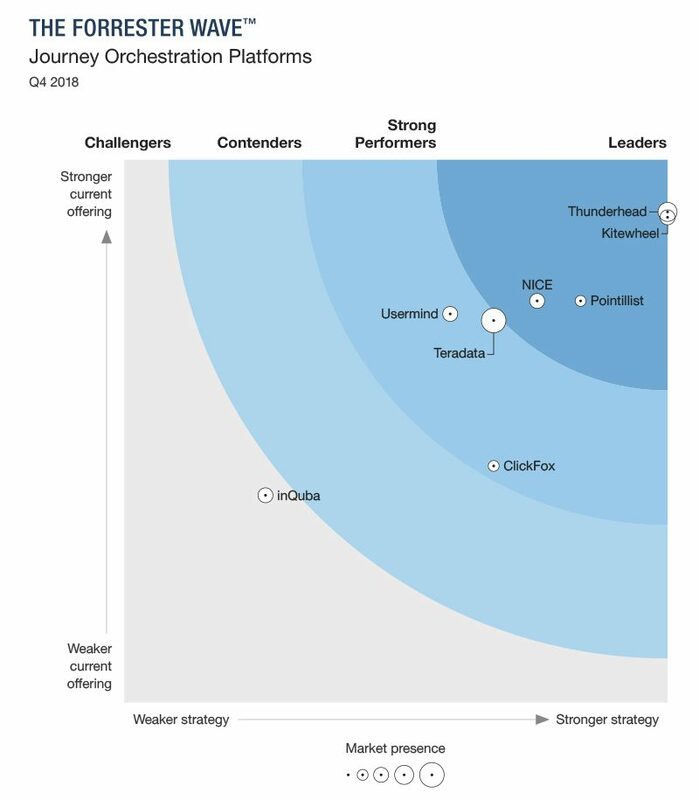 So it is little wonder that Forrester provides a seal of approval with its Analytics Visioning and Orchestration Wave™ reports. I’m very pleased to say the market is coalescing around our vision for ONE and based on what we’ve seen over the last six months the most significant growth will be from brands able to harness true journey orchestration at scale. The Wave™ research serves as confirmation that aspiring to “put customers at the heart of what we do” is no longer an empty platitude. Put simply, everything starts with a journey. Looking ahead, we’ll see a cultural shift at the highest level: successful businesses will be asking ‘what does this customer need?’ rather than ‘what are we trying to sell?’ And if you’re onboard, it won’t just your customers that will reap the benefits.